Wings are way up there -- we're talking close to the top -- on everyone's list of favorite party foods. Combine chili sauce and cranberry sauce in medium saucepan. Cook over medium heat, whisking occasionally, until smooth. Reserve one-third of sauce mixture. 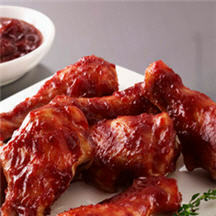 Arrange drummettes on baking sheet coated with non-stick spray. Turn drummettes over. Brush with remaining sauce mixture until well coated. Bake for additional 20 to 30 minutes or until chicken is cooked through. Serve hot with reserved sauce for dipping. Recipe and photograph provided courtesy of ©H.J. Heinz Company, L.P. 2008. All rights reserved; ©2008 Ocean Spray Cranberries, Inc. All rights Reserved, through ECES, Inc., Electronic Color Editorial Services.